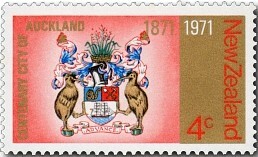 Virtual New Zealand Stamps: 1971 Three City Centennaries. 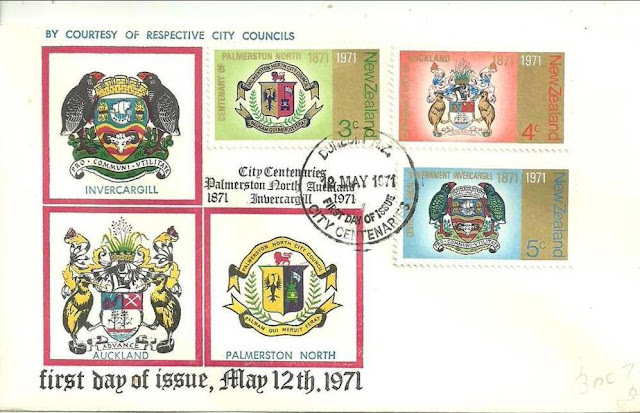 Three city centenaries were commemorated in this 1971 commemorative stamp issue: Palmerston North - centenary of its founding; Auckland - centenary as a city; and Invercargill - centenary of local government. The design incorporates the city's coat of arms. 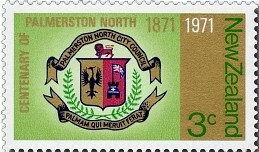 Palmerston North, NZ's second largest provincial city, with about 84 000 people, is situated alongside the Manawatu River 140 kilometres north of Wellington. The site of the town was part of a block bought by the Government from the Maori owners in 1864. The town was laid out the following year, and settlement began in 1866. 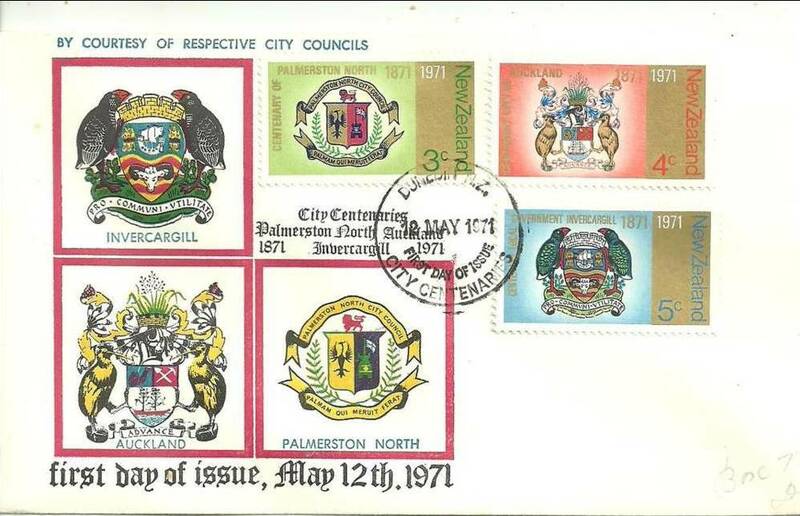 Today (2015) Palmerston North is the major commercial centre for the south/central region of the North Island, servicing a large, highly productive farming area. It is home to more than 70 major educational and research institutions, including New Zealand's fastest expanding university, Massey University. The design incorporates the city's coat of arms. Auckland, NZ's largest urban area, straddles the isthmus between the Hauraki Gulf on the east coast and the Manukau Harbour on the west coast of the North Island. The settlement and later the province were named after the first Earl of Auckland, George Eden, who was Governor-General of India when the settlement of Auckland was founded. The city was established in 1840 as the country's second capital, a status it lost in 1865 when Wellington was considered more central in a long country with transport difficulties. On 1 November 2010, the Auckland Council was established combining the functions of the previous regional council and the region's seven city and district councils into one "super council" or "super city". 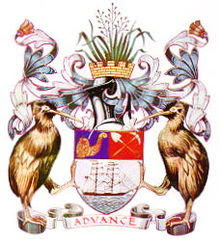 The City of Auckland has a coat of Arms emblazoned as; Argent, upon waves of the sea a two-masted ship in full sail proper flagged Gules, on a chief per pale Azure and Gules to the dexter a Cornucopia Or, to the sinister a Shovel surmounted by a Pick, in Saltire proper. Crest: Issuant out of a Mural Crown Or a representation of the Phormium Tenax flowered proper. Supporters: On either side an Apteryx proper. Motto: Advance. View our post - Arms Postal Fiscal - Part One. The design incorporates the city's coat of arms. 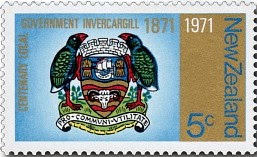 Invercargill was for more than a century the fifth largest urban area in New Zealand. Its population is around 52 000. It is the southernmost city in the country, and one of the southernmost settlements of any size in the world. The principal city of the province of Southland, it is sited on the Waihopai River. A few kms south of Invercargill is the regions main port at Bluff. First Day Cover designs for this issue. 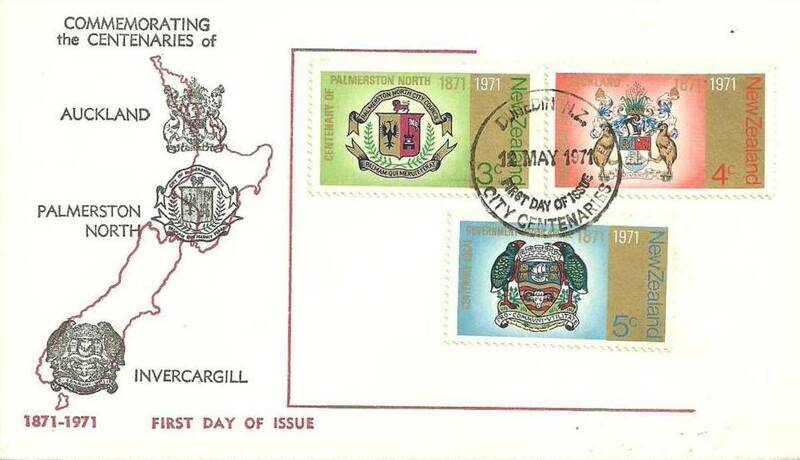 Two interesting designs with the top cover showing each of the coat of Arms in greater detail while below the arms are placed over the map of New Zealand showing the general location of each city. Personally I prefer the lower design as I feel the large illustrations on the top cover dominates the cover and takes away attention from the stamps themselves.